Seized spark plugs can foul up any tune-up! In order to interpret engine performance, you have to pull all of the plugs for visual inspection. 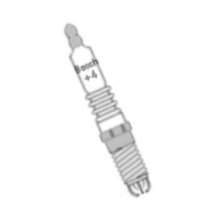 Even if your spark plugs indicate that your engine is running properly, electrode wear may be cause for replacement. This tutorial should help you to remove any seized spark plug, whether gasket-style or tapered. 1. Start with a hot (operating temperature) engine, with cast iron heads. You might find a 'heat wrench' all you needed. Before I go any further, aluminum heads should be cold, to prevent spark plug threads from tearing out. Try your luck, careful not to burn yourself on the exhaust manifold. Fight the temptation to use a socket extension, as they will reduce your leverage, the longer they are. Use one no more than 6" in length, if you absolutely have to. 2. Brush Never-Seez lubricant onto the threads of new plugs, before replacing what you can initially. Use compressed air to clean any dirt or rust from the Spark Plug ports, before installing Plugs, to insure that they seat properly. Start the plug thread by hand, to prevent cross-threading. Spray a small amount of PB Blaster at the base of the stubborn Plug(s). Start the engine and idle it until you reach normal operating temperature again. Now that you have the benefits of a superb penetrating oil AND a 'heat wrench' working for you, try again. With aluminum heads, apply Turpentine to the base of the seized spark plugs allowing it to work down into the threads. They should remove easily, afterwards. 3. Use a breaker bar and an impact socket as a last resort, if still unable to remove one or more Plugs. Trying this with a Ratchet could crack the ring gear inside and destroy the tool, besides bust your knuckles! Regular chrome plated sockets, not meant for high torque conditions, can shatter under load. Keep in mind that trying to muscle the plugs out could actually tear threads out of a cast iron head. Especially true of aluminum heads. Patience is a virtue! 4. Spray a little more PB Blaster and let it work overnight, if time is not an issue. It should break free, in the morning. If not, heat up the engine and try again. * PB Blaster is an excellent penetrating oil and has many beneficial applications. * Turpentine is helpful in removing seized spark plugs from aluminum heads, when used as a penetrant. * Be careful of a hot exhaust manifold and hot Plugs! * Any time you apply a penetrating oil in an area that reaches high temperatures, be prepared to extinguish a fire. It probably won't flash, but you are better off prepared than not! * A General-Use fire extinguisher is ALWAYS a good thing to carry inside your vehicle! Besides your ride, it could save a life! * To avoid seized plugs, be sure not to over tighten when installing cold.